The Small Office Building is one of the best examples of the work of architect G. Milton Small. From the late 1940s through the 1960s, the City of Raleigh was a proving ground for the architectural movement known as Modernism. 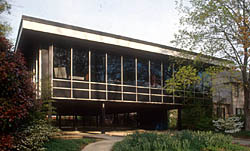 Dean Henry Kamphoefner of the School of Design, established in 1948 at North Carolina State College (now North Carolina State University) recruited several Modernist architects as faculty members, and was instrumental in influencing other Modernists to come to North Carolina to practice. One of the most influential architects that Kamphoefner helped bring to North Carolina was G. Milton Small, who moved to Raleigh in 1948 after studying with Mies Van der Rohe in Chicago. Over the next several decades, Small produced a body of work that distinguished him as the most accomplished proponent of Miesian modernism in the area. Small's own office building, completed in 1966, summarizes key elements of his work over the previous 20 years. To make the best use of a tiny site, the occupied space of the building is raised a story on steel columns, allowing for parking and a fountain-lined entrance walkway underneath. The building seems to hover behind the trees next to the street. In the Miesian tradition, the building is a rectangular box of glass and metal panels with aluminum mullions and an overhanging roof slab. A close examination of the facade and elevations, however, reveals subtle differences in the window and panel configurations, depending on the type of space behind the wall in each area. The entrance to the building is by way of a stairway that rises up into an outer lobby area. From that point, the plan of the building has a clear hierarchy of spaces, with rich finishes for the reception and conference room/principal's office and frankly exposed framework in the long drafting room. Throughout, the black-painted steel columns are exposed in Miesian fashion, and the wall panels are painted in the De Stijl movement colors of black, white, and primary red, blue and yellow. The Small Office Building is a designated Raleigh Historic Landmark. The G. Milton Small and Associates Office Building is located at 105 Brooks Ave. It is now home to HR Associates PA and is open during regular office hours.